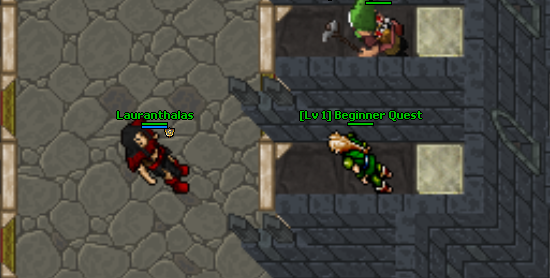 The beginner quest is Cyntara's first quest that allows new characters to learn how quests work, while raising them from level 90 to about level 350. 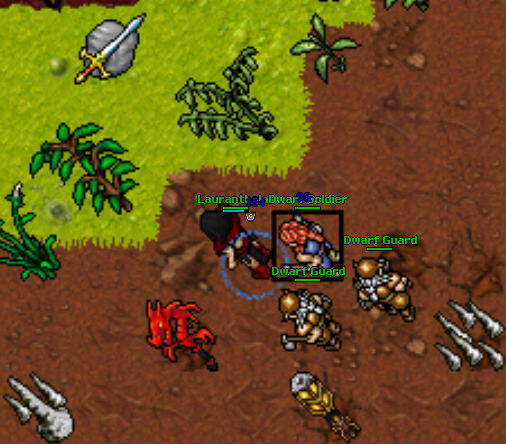 It is a different experience for each vocation type, Druids and Sorcerers share a quest, where Knights and Paladins have their own. 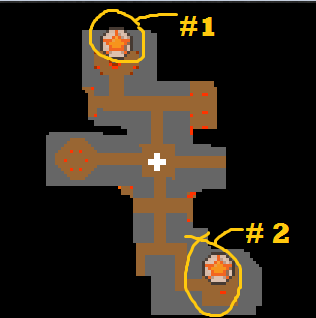 In case of death these are images of the spawns used during the Beginner Quest. 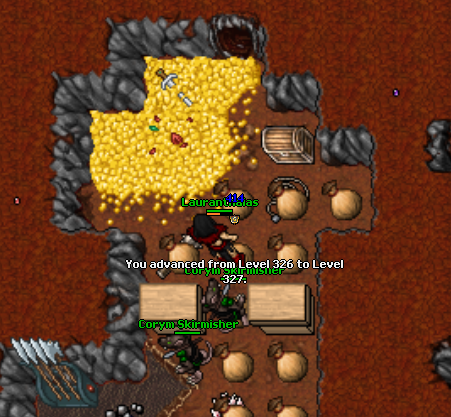 You will arrive in the monster spawn area until you are over level 400. 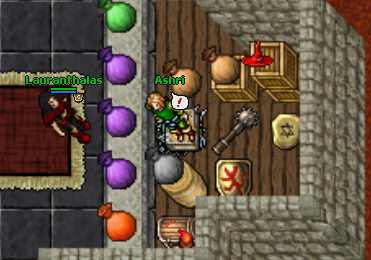 From here we talk with the quest NPC Ashri. 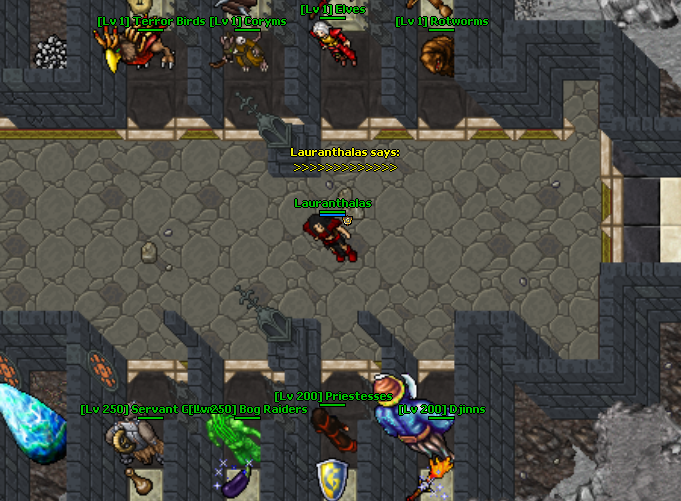 To start your quest you are sent to the Coryms spawn to retrieve money from the Corym bank. Then go right and up until you locate the Corym Bank shown below. Return to Ashri for your next quest. 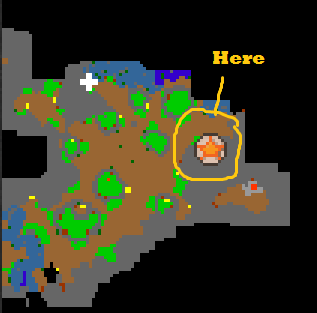 For the next section you are sent to the Dwarf spawn to locate the Warlord Sword. You will receive confirmation in your General chat tab, when you have completed this section of the quest. 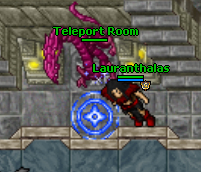 In this section you are sent to dispatch Lensine, a spellcaster who disguises herself as a Behemoth when you enter the room to fight her. Here there be Dragons! For this section of the quest you are given your first task, and that is to kill 10 dragons. 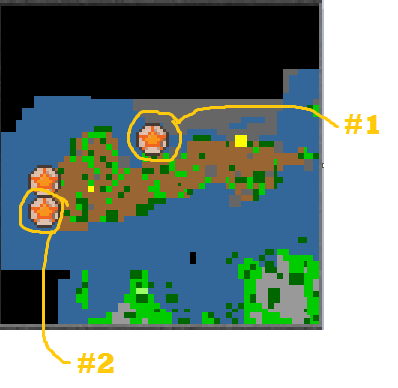 While there are also Dragon Hatchlings and a Dragon Lord in this spawn, they do not give credit towards the quest. You will receive notifications in your General chat tab for each dragon you kill, as you do with all tasks as shown below. For Quest 5 for each vocation, the quest lines split and will be explained in detail below. For druid/sorcerer section of the quest Buddy sends you to the Crazed Beggar area to find 2 astro-clocks and use them. 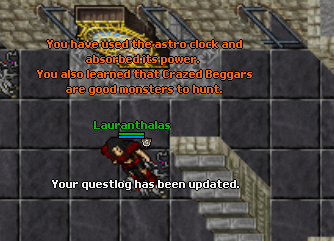 When you use a astro-clock, orange text will appear, and once both are hit you will receive a "questlog has been updated" message. For the Knight section of the quest Buddy sends you to the Giant Spider area to find 2 strange tentacles and use them. 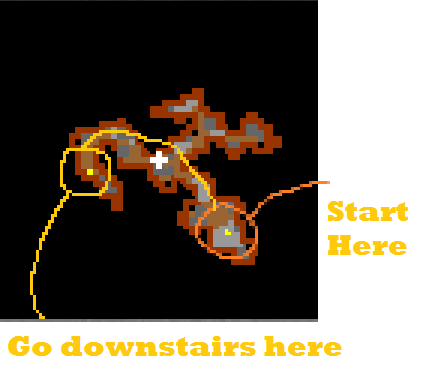 Both are in the same area within the Giant Spider spawn about halfway in, requiring you to drop through a pitfall and descend a flight of stairs to the south. 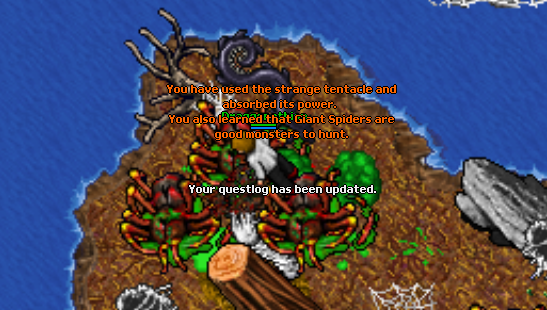 When you use a strange tentacle, orange text will appear, and once both are hit you will receive a "questlog has been updated" message. 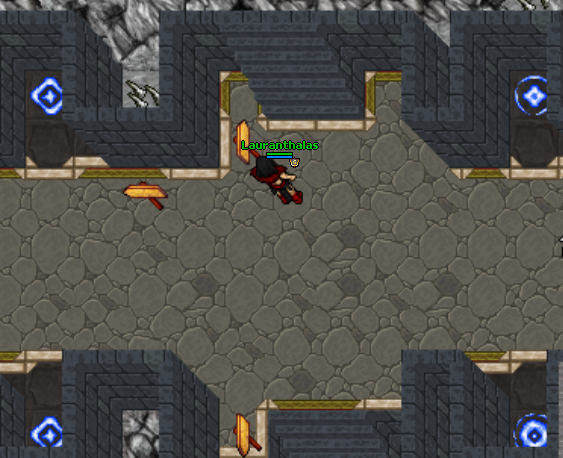 For the Paladin section of the quest Buddy sends you to the Priestess area to find 2 dragon wells and use them. 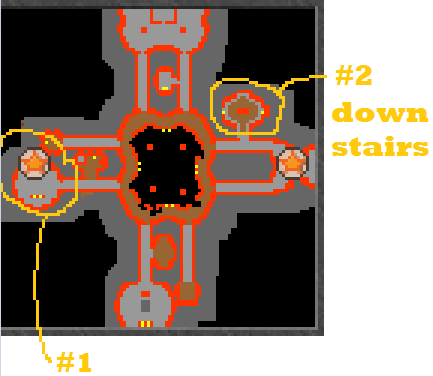 Both are in the same area within the Priestess spawn once you enter the main spawn. One is in the north-most room and one to the south of the ladder you enter from. 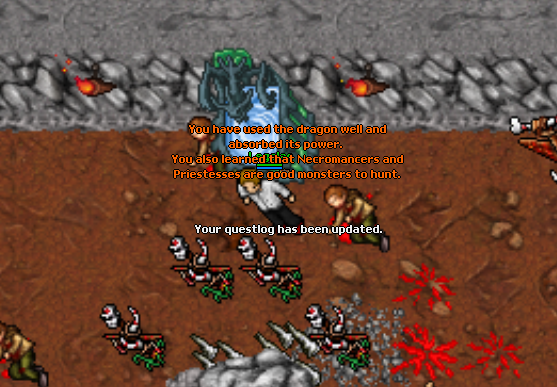 When you use a dragon well, orange text will appear, and once both are hit you will receive a "questlog has been updated" message. These are the videos i made, there was only supposed to be one, but i accidentally hit the stop record button.